In cesarean or C section process, the baby is delivered by making an incision in the abdomen and pulling the baby out from the uterus through this incision. C-section can be pre-planned so the anxiety and stress for expected mothers are less. However, during C-section birth there can be heavy loss of blood and are more prone to various infections and clots in the abdominal incisions. 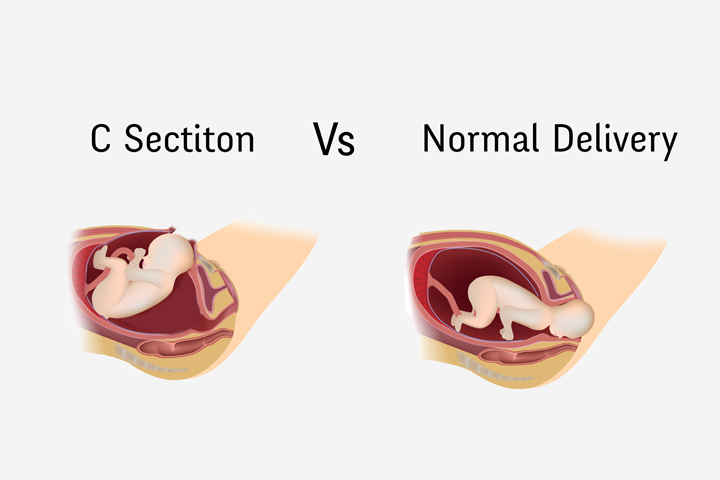 If the expected mothers have twin babies then the doctors may recommend for C section depending on the overall health condition of the pregnant women. Also patients with medical conditions such as hormone imbalance, diabetes, blood pressure variations or any infection in internal organs are also scheduled for a C section to safely deliver the baby without any future complications. The recovery period from the birth process is longer in C-section when compared to normal delivery as the incision made in the abdominal wall and uterus has to come back in normal state. The post surgery issues include low bowel movement and milk secretion may take time when compared to the normal delivery process. At Greenview medical centre we have an expert team of doctors, nurses and midwifes to discuss and organize delivery options and appointments and to take proper care from the beginning of the pregnancy to childbirth with no complications. Depending in the health condition and reports from the pregnancy period the doctors suggest for normal delivery or C section and discuss the details with the expected parents. At Greenview medical centre, we have a team of experts to help you treat and recover from all medical conditions. We have the best medical infrastructure and medical utilities to provide all round care and support to the patients. For any queries related to normal or C section birth process contact us.